Hey oh!!!! Layne here. Yeah, so this is my first time blogging so please forgive me if my blogging skills are not quite up to par. I am so excited to get things started! Soooo...basically, I want to introduce you guys to some of my favorite things. Makeup, skincare, nail polish, clothes, shoes, dogs, songs, food...etc etc. So let's get this thing rollin'! When I worked as a beauty consultant I basically became a makeup hoarder. I would buy any and everything I possibly could with my ah-mazing discount, knowing that I had five of the same product at home in my beauty drawer. My mama always said I could open up a makeup counter in my bathroom. Oh mother! You were sooo right! 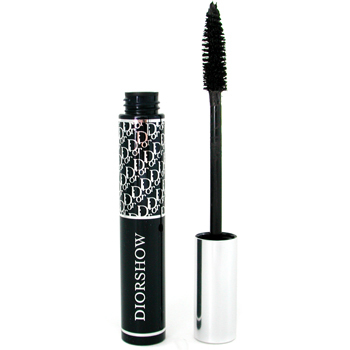 One of the products that I fell COMPLETELY in love with was Christian Dior DiorShow mascara. Oh My Gah! This stuff is unbelievable. The brush is humungous, the quality and texture of the mascara itself is so soft and glides on. You have NO trouble layering this and it doesn't flake! Heaven in a mascara bottle... no lie! The benefits of the thick brush are that you can distribute the mascara evenly over all the lashes, giving them a full, long, and voluminous look. Even if you apply two or three coats, you won't look as though you have a tarantula on your face. That's always a good thing, right? It also has a great scent to it. It's not overwhelming, but it has a nice, light fragrance. If you find that you prefer waterproof, they offer the DiorShow in that as well. I would not recommend this to someone who is highly sensitive to any perfumes. It may cause irritation and I really don't want anyone going blind, okay? As far as the price point, it is a little on the expensive side. It runs about $25. You are essentially paying for the high end name of Christian Dior. But it is a product that I would spend the money on at least once. You can purchase any Christian Dior product at Sephora or Dillards (Southpark only).